"Oh, oh! I know it. I know it! "They know it because they've already become fluent readers and skillful thinkers. Mt. Helix Academy’s curriculum is designed so that all students learn the important critical thinking strategies they will need and use in high school, in college, and in life. Students at all levels are specifically taught important comprehension skills that allow them to answer both literal and increasingly difficult inferential questions with ease. 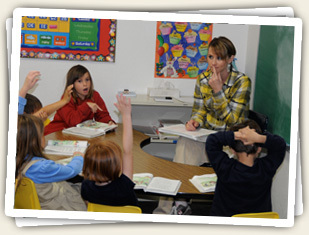 These comprehension skills enable students to think critically in all areas of the curriculum. Beginning in the Elementary Module, the focus changes from “learning to read” to “reading to learn”. At this time, students apply their reading skills to content-area texts, which they read and understand effectively. Mt. Helix Academy’s curriculum, which meets or exceeds California State standards, systematically builds new skills and knowledge on those already taught. It is designed to provide as much practice as the students require in order for every student to master each lesson. Moreover, what is learned never goes away because our curriculum includes cumulative review of the skills and knowledge previously taught. they are continuously challenged to think critically.